Andrea Radrizzani has written to the FA, EFL and Premier League seeking clarification over Wolves' links to Jorge Mendes. Andrea Radrizzani revealed that he was considering copying Wolverhampton Wanderers’ methods of recruitment after asking the EFL, the Premier League and the Football Association to address the link between the Molineux club and agent Jorge Mendes. Wolves’ connections to Mendes, who has several clients on the books at Molineux including manager Nuno, have come under sudden scrutiny in the past week with the club on the verge of securing automatic promotion to the Premier League. Fosun International, the Chinese firm which bought Wolves in 2016, also owns a stake in Mendes’ agency Gestifute but the EFL saw no conflict of interest at the time of Fosun’s takeover. The governing body, however, reacted to pressure from rivals clubs by agreeing on Thursday to meet with officials at Wolves and re-examine the relationship with Mendes, despite the club’s insistence that they are compliant with the both Financial Fair Play (FFP) and governance rules. Wolves chairman, Jeff Shi, described the criticism of their recruitment as “laughable” earlier today, claiming that Radrizzani’s original outburst on Twitter had been driven by the pressure of Leeds’ deteriorating season. But speaking to the BBC, Radrizzani said: “It's an opportunity for me to clarify the rules because I want to build a successful team on the pitch like Wolverhampton. “To do it I might need to have five or six players on loan from an important agent or important clubs in Europe. I need to understand if it's practical as I would like to do the same. “I know many agents. I know Jorge Mendes well. I would love to have their help. I just want to know if it’s possible to do it within the rules. Prior to buying an initial 50 per cent stake in Leeds in December 2016, Radrizzani gave up shares and a directorship in a separate agency, Football Capital, in the belief that retaining the stake would contravene EFL regulations. Radrizzani said he had contacted the Premier League to ensure that a strategy like Wolves’ would be permitted in the event of future promotion from the Championship. Aston Villa and Derby County have joined United in complaining to the EFL about the signings at Molineux, questioning how the deals and the wages of the players concerned are being funded. Portugal international Ruben Neves was among those signed by Wolves last summer, arriving from Porto for a fee of £15m. 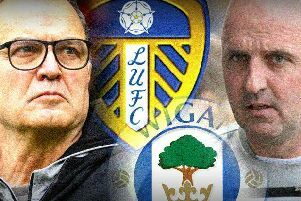 Shi, however, rejected the questions being aimed at his club, telling the Express and Star: “I was very surprised to see some Twitter of the chairman of Leeds because I knew him, I also had several lunches with him, together with Jorge. So it’s very strange. “In person I talk to him and he’s nice so I guess maybe he has the pressure and I understand that. I’m the chairman of a club so I can understand the pressure. We’re the guys facing pressure from fans and the league and I can understand releasing pressure on Twitter. “On the other hand I think frankly it’s laughable because they know nothing about us. I know everything about us and our club and what we’re doing. I know everything about the rules of the league and the FA and the EFL knows our dealings - every transfer document, agent fees, all information is recorded in their library.